The Sony Tower was designed as a solid showroom for Sony Electronics. 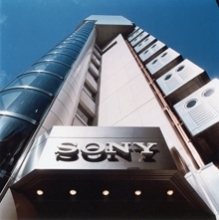 From the beginning, Sony Tower was planned to be a real-time, on-line "information tree", connecting other Sony Towers in New York, London, Paris and other major cities by satellite. Along the outside of the central display space, the stairs, elevator, escalator, and toilet are capsulized. The capsules are the same size as those of the Nakagin Capsule Tower, but the exterior is made of stainless steel. To connect the basement to the public parking lot, the utility rooms are all placed on the roof. The utility pipes are exposed, also like those of the Nakagin Tower, to facilitate the maintenance and recycling of the pipes. The Sony Tower is another prototypical example of sustainable architecture. The showrooms are as it were a stage set for Sony products and customers in free contact. For this, the design tries to fuse the individual identity of each material and colour to produce an abstract sense of continuity.